The differences between the main types of bass box is quite a detailed subject, but below are some pointers on which one to choose. Also known as 'Infinite Baffle' ('free air' is a misleading term but somehow got adopted as a description), this does not use a bass box in the regular sense, but instead uses the boot (or trunk, for our US friends) as a cabinet. The speaker may be mounted on to a panel (the 'baffle board') behind the rear seat, or suspended from the rear parcel shelf, so it fires sound through the ski hatch or simply through the back of the rear seat. The rear and front sound waves from the speaker must be completely isolated one from the other (hence the term 'infinite baffle' or never-ending baffle - the 'baffle' being the name of the board or panel that the speaker is fitted to), otherwise one will cancel out the other (which causes what's known as phase cancellation). 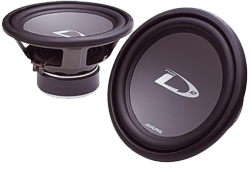 Only use a subwoofer designed for 'free air' mounting, as these will have a stiffer suspension. This is usually a cheaper method of fitting a subwoofer to your car, but the air space in the boot is generally too large and not sealed well enough to provide any extra help or damping to the speaker. The speaker can therefore easily over stretch itself (called over excursion), causing severe mechanical damage if it's driven too hard. Some speakers are made with a very stiff mechanical suspension to help cope with this - don't use a speaker designed to be mounted in a small box - and with good installation methods (sealing the boot area, especially making sure the passenger compartment is sealed off from the boot area, with no leaks around the baffle board) this can still give good results. As the name suggests, this is a sealed box. It will generally give a tight, well controlled sound, with a natural roll-off. Good for rock, jazz, classical music and pretty much everything else. The trapped air helps to provide good mechanical protection to the speaker at high levels (this limits over excursion). It's the easiest box to get right. But it tends to be less efficient (produces less output overall) than a ported system. When designing any kind of enclosure, always avoid building square boxes - these can cause 'standing waves' to build up inside the box, which can cause a very unpleasant boominess. Where possible, have at least one non-parallel panel. For example, having one panel angled (either snug up against the back of the boot, or with the sub mounted on it) helps to reduce standing waves. However, in most cases anything other than a square box will be OK, as long as it is sturdy and rigid - don't use thin cheap chipboard. 15mm thick MDF is the minimum, 18mm is better but don't forget the effect it will have on petrol consumption if it's a big heavy enclosure. If using Plywood you can get away with using thinner panels - 12mm thick Plywood is very good (half that thickness is also fine for small and medium size boxes if you internally cross-brace the box, as Plywood is good stuff, naturally very rigid and less porous than MDF. 15mm Plywood is excellent but expensive. Also known as a vented box, has one or more ports or vents which are tuned to the size of the box and the requirements of the speaker (not any old tube will do unless you're damn lucky!). This will generally give considerably more output (higher efficiency) than a closed box in the region between 30 to 80Hz. This gives it a big sound, well suited to dance music styles, but when combined with the natural boost caused by the passenger compartment, it can result in an unnaturally big and under-controlled bass sound. Only use a subwoofer designed for vented enclosures. Subs designed to be fitted in to closed (sealed) boxes are likely to have a less stiff suspension and could be damaged at the point where the box 'unloads' below the tuned frequency... mmm, confused right? OK, let's explain it a bit. Below the port tuned frequency the cabinet 'unloads' (that means the air inside no longer acts as a brake) and this can cause a sudden 'over excursion' of the speaker driver (means it travels way too far for its own good). At high levels this can be terminal! For this reason, ported boxes designed for high sound pressure levels (SPL), especially competition, should have additional protection. For example, a sharp electronic subsonic filter on the amplifier (24dB per octave or better) with a very accurately calculated turnover frequency. Even then it's risky... but then big bass and high SPL is always risky, it's what makes us do it! A hybrid of the ported enclosure, the bandpass box houses one or more speakers fully inside the cabinet, so that the speaker does not directly radiate sound to the car. The sound exits only via the port, often a rectangular vent. As the speaker has a controlled mass of air on both sides of the cone, it has a high degree of mechanical damping and control. The result is a high efficiency, high output system. And see-through acrylic bandpass cabinets look very cool! Is there a downside? Well, kind of. Bandpass cabinets output a relatively limited frequency range because of the vent design - this isn't necessarily a problem but needs to be taken into account when designing the overall speaker system. Also, speakers can become toast before you know it, because having them fully enclosed hides the telltale distortion that would tell you to back off the volume control. Add to that the fact that bandpass designs are generally more complex and more difficult to get right, so they tend to cost more to build, and you may wonder if it's worth it. But a well designed bandpass box can provide huge, very focussed bass output and very good dynamic impact.